There are both men's and women's versions of Ed Hardy Hearts and Daggers perfume, so you can get a perfume spray for yourself and your partner. Women have a choice between two different sizes of Ed Hardy Hearts and Daggers perfume spray and men can choose between eau de toilette spray and fragrance gift sets that contain multiple products in the Ed Hardy Hearts & Daggers scent. 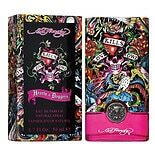 The Ed Hardy Hearts and Daggers perfume gift sets for men include both a regular size spray and travel-size spray that fit in your pocket or gym bag. In the three-piece gift set you'll also get a shower gel that you can use for your first layer of fragrance. If you get the four-piece Ed Hardy Hearts and Daggers perfume gift set you'll also get a scented deodorant you can use as your second layer. Finish with the Hearts and Daggers perfume spray for a longer lasting scent. Among Ed Hardy products there are other signature scents for men and women. Ed Hardy Love & Luck comes in a version for men and one for women. There's also Ed Hardy for Men and Ed Hardy for Women. Ed Hardy products also include gift sets of the Ed Hardy perfumes.